16th seed Vladislav Kovalev has won the 2018 Aeroflot Open and will play in Dortmund later this year after 2700 stars Fedoseev, Vidit, Andreikin, Mamedov and Matlakov all failed to make an impact on what’s often known as the world’s toughest open. The 24-year-old from Belarus could afford to take a last-round draw in a better position after winning all five games with the white pieces on the way to 7/9. Sethuraman and Dmitry Gordievsky finished in 2nd and 3rd places on 6.5/9, ahead of seven players on 6/9. Vladislav Kovalev will face a supertournament baptism of fire in July when he plays in the Sparkassen Chess Meeting in Dortmund, with Vladimir Kramnik likely to be among his fearsome opponents. Although Kovalev won the Belarussian Championship in 2016 and is the current national no. 1, it’s fair to say this is the biggest achievement of his career, though he did have a dress rehearsal! In 2017 he was seeded 41st but finished 3rd in the Aeroflot Open after beating Movsesian, Sjugirov and Khismatullin on the way to a 2791 rating performance. Only winner Vladimir Fedoseev scored half a point more. Kovalev’s performance rating this year? Incredibly it was exactly the same, 2791, with a perfect grandmasterly result of five wins with White and four draws with Black. The turning point of the tournament perhaps came in Round 6, when 19-year-old Vladislav Artemiev, who had raced into the sole lead on 4.5/5, looked set to make a real statement just before his 20th birthday. Instead Kovalev comprehensively outplayed his opponent in a 3.Bb5 Sicilian to take the lead, while Artemiev creeped across the finish line with three draws – enough to mean he should finally be rated above 2700 on the 1 March FIDE rating list, though he’ll have to wait a little longer for some classical supertournament action. Update: Although the rating list publication was a little delayed it so far hasn't included the Aeroflot games, so it looks as though Artemiev still won't officially have crossed 2700 when he turns 20 on 5th March. To be fair to Tabatabaei, he’s far from alone. Fabiano Caruana played the move against Vladimir Kramnik in the Altibox Norway Chess blitz and only eventually won the game after Kramnik blundered later on (curiously, the Aeroflot game only deviated from that game with Tabatabaei’s 12…f6 instead of 12…Bd7). The most notable encounter, though, was the final game of the 2017 European Rapid Championship, where Poland’s Jan-Krzysztof Duda needed only a draw to take the title, but played 7…Nd5?! and went down without a fight to Russia’s Maksim Vavulin, a player who was also present in Moscow. In the 8th round there was a decisive game with a young Iranian chess player. 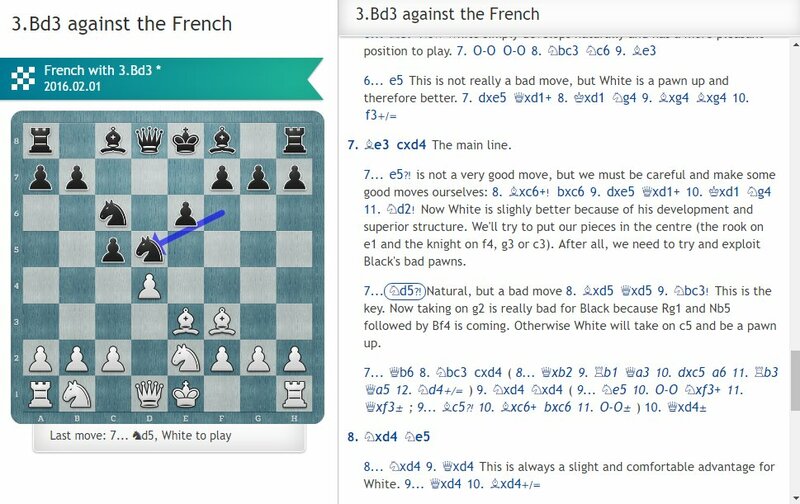 I got a bit lucky: in the opening he blundered after my trap that I’d looked at a few years ago. It turned out he fell into it and I immediately had an advantage after the opening. I couldn’t recall the variations, though, despite everything being written down literally to a win, so I had to convert what became a technical position. Tabatabaei put up tough resistance, but in the end a pawn was a pawn and Kovalev took a full point lead into the final round. There were 9 players on 5.5/8 who could at least catch Kovalev if he lost, with Sethuraman and Dmitry Gordievsky the only players in that group who had the tiebreak advantage of playing more games with the black pieces. They did in fact both win – Bologan 0-1 Sethuraman and Tabatabaei 0-1 Gordievsky – and would have finished ahead of Kovalev if he’d lost, but of course he didn’t! Needing only a draw Kovalev was much better with the black pieces against Gabriel Sargissian after just 17 moves, but was happy to settle for a draw that gave him the €18,000 first prize and the title. Sethuraman took silver and Gordievsky bronze. The Aeroflot Open is a notoriously tough tournament, but few could have predicted that none of the five 2700 players who started the event would be challenging for the title. They finished in 46th place (Fedoseev, 2724, top seed), 35th (Vidit, 2723, 2nd seed), 22nd (Andreikin, 2712, 3rd seed), 16th (Matlakov, 2709, 5th seed) and 10th (Mamedov, 2709, 4th seed). Maxim Matlakov (2709) scored one admittedly nice win against Maksim Chigaev in Round 1, won by forfeit in Round 3 when Gupta was sick, and drew his remaining games. Dmitry Andreikin also beat Chigaev, in Round 4, and drew all his other games. After seven rounds 2nd seed Vidit (2723) had drawn all his games, and we were tempted to tweet about seconding Anish Giri paying dividends. We decided that was a bit unfair, but when he won in the next round Giri did it himself! Vidit got back on track to draw in the final round. Top seed and defending champion Vladimir Fedoseev was frustrated in an ending a pawn up in the first round, but then seemed right on course to challenge after wins in rounds 3 and 4. The problem then was that he came up against his coach, Alexander Khalifman, and a 9-move draw ensued. He seemed determined to make up for that unofficial rest day by crushing his next opponents, but it backfired spectacularly. …27…Rxh5! 28.Rg1 Qc2 29.b4 a5! and the white king was eventually hunted down. That calamity meant that for a chance of winning the tournament only a win would do in the next round, and playing with the black pieces Fedoseev went for 1.c4 Nc6 2.Nc3 e6 3.g3 g5!?!? 26…Rd2+!! is a beautiful only move, but Black was only hanging on, and soon he lost the thread and slipped to a second crushing loss in a row. That was the signal for Fedoseev to abandon his Napoleonic ambitions, or in fact any ambition whatsoever – he drew against Chigaev in 11 moves in Round 8 and against Kirill Shevchenko in 9 moves in Round 9. To rub salt in his wounds his coach Alexander Khalifman finished 1 point and 32 places higher, gaining 14 rating points, by simply deciding to coast to the finish line. He won his first two games and then made 7 draws in 31, 12, 9, 23, 17, 19 and 13 moves. 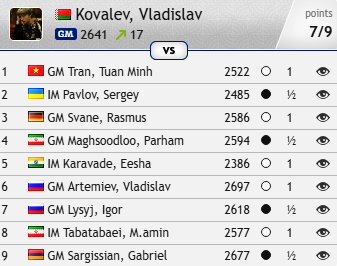 Only Rauf Mamedov (2709) of the 2700 players came close to playing at his rating, despite a first round loss, finishing with a 2676 performance in 10th place. It was a good bet before the tournament began that all the talk would be about prodigies, since there were simply so many talented juniors on show. In the end, though, despite 15-year-old Kirill Shevchenko beating Gata Kamsky in Round 1, they struggled, as did almost everyone in such a tough competition. 12-year-old Praggnanandhaa’s chances of beating Sergey Karjakin’s record as the youngest GM in history look slim after 8 draws and 1 loss wasn’t quite enough to give him a second GM norm. 13-year-old Nihal Sarin also finished winless, with two losses in the last three rounds taking some of the shine off his tournament. It’s notable, though, that both players performed above their already impressive ratings. The game only turned completely on its head with the unfortunate time control move 40.Rc1? What’s wrong with that square? 40…Bxf3! (or you can start with 40…Nxf3!) and if 41.Bxf3 Nxf3 42.Qxf3 there’s 42…Qd2!, a double attack on the rooks on c1 and h6. The white king gets in the way of their saving each other. That’s not all from the Aeroflot Open, with Nakamura, Karjakin, Gelfand and Mamedyarov among the players joining for a blitz tournament on Thursday (there will be live Russian commentary, but the moves won’t be broadcast), before the Tal Memorial starts on Friday with Kramnik, Grischuk, Svidler, Karjakin, Nepomniachtchi, Mamedyarov, Nakamura, Anand, Gelfand and Dubov. We’ll have all the moves from that 4-day event with live commentary in English and Russian!